Great Reasons To Getcher Web at Webs-a-gogo! - Welcome to Webs-a-gogo! Home of the FREE Website Builder and Designer. Experts in Business Websites | Personal Websites | Professional Websites - Webs-a-gogo/Websagogo provides a free and easy website builder for creating Website Designs for a high profile Business, Personal or Professional web presence. Our easy Website Builder offers pre-designed and Customizable Web Designs. Webs-a-gogo WAG-PACs include a Free Domain Name and Website. Great Reasons To Getcher Web at Webs-a-gogo! Our Webs are High Quality, High Profile, Search Engine Beacons that you can boast while saving Time and Money! Aside from the standard pitch below about how great our webs are, there are some very practical reasons why you want to choose Webs-a-gogo! In fact, the most practical word we can thinks of is "Details". Because we live in the details, we discovered or learned, what folks need. Over the years, we listened and we developed many different applications and features and functions for our clients to use on the web. And it's because we accumulated that created technology (details), and, in included all those features in our WAG-PAC offering, that we offer more than anybody else we know. Forget price wars and megabyte wars over stuff you won't even use. The other guys just don't even have what we have to offer...at any price. Period ! All-inclusive Pricing Philosophy: We include the stuff you actually need to make an lasting impression. We don't offer a low price for the basics using the latest lingo and buzz words to hook you and then " 2 and 5 dollar a pop" you to where we want you on the cost per month scale. We give it to you straight and all at once. The price we quote is what you pay. You always know it up front and always lean to the side of the customer. We believe in doing business that promotes trust. So we include it. Over the years we have built many, many, many websites. Over the years our customers have told what they need. Some needed this, some that. Some custom modifications for an elite few have now become the standard for all our clients. Some niche market applications have now become available to all our marketplaces and to all our clientelle. Our exclusive WAG-PAC is the successful result and combined effort of our development team all wrapped up into a single Webs-a-gogo web package (WAG-PAC) designed to provide you all the tools necessary to make a lasting success with your clients or your public. Simply put, the idea is "your continued success". If you don't get yours, we don't get ours. So we give you everything our experience says a person or company needs to bring their name and their stuff to the web....in style and high profile. History shows that most folks will not need everything our package offers at first. Some of the services you will need to grow into. Others you will use immediately. But it is nice to know the stuff is there if and when you need it. Without the hassle of adding new services and new expenses. To be fair to the other guys however, we must acknowledge there are certain "additional" services, which we pay for, that we must, in turn, charge for. Depending on the cost of a WAG-PAC, we may have to charge a small sum for services we re-sell such as an SSL Certificate, or a Site Tracking and Analytics Package. But items like these are not the norm for most businesses and folks looking to establish a presence on the web. But should you need them, we've got them. Plus we can also show you how to use your site together with many free services offered by specialty companies. Now ... is the stuff you need in our Webs-a-gogo WAG-PAC ? Unlimited webpages using our Press Article Page module? it's in there! Unlimited Products/Services Catalog with a department and category heirarchy to show your stuff? it's in there! Unlimited Blogs? it's in there! Unlimited Calendar...web-based? it's in there! Unlimited Links page for linking to others..and yourself? it's in there! Unlimited Transactions via shopping cart? it's in there! PayPal ready? it's in there! Authorize.net for Online Credit Card (CC) Processing or Manual CC processing using your own ZON machine at your shop with email notification and order details recorded and stored in your database with customizable reporting? it's in there! Sales reporting? it's in there! Contact Forms? it's in there! Guestbook, forum, video ready pages, Mail-A-Friend Pics & Pages & Calendar events for marketing your stuff? it's in there! Email enough for everybody in your smalll, medium or large organization, company or family. Up to 200 accounts? it's in there! Web-Based Daytimer integrated right into your popable or web-based email? it's in there! Aliase Email addresses and a Mailing List Server with Subscribe feature? it's in there! SQL databasing for robust and fast data processing? it's in there! Graphics and image optimization and re-sampling of uploaded images for fast page loads? it's in there! Backups going back 30 days for your crash / mistake protection? it's in there! Artwork, graphics library for your royalty free use? it's in there! Hundreds of Templates to choose from? it's in there! Multiple colors for each design template...plus monochromatic color options? it's in there! Search Engine Optimization (SEO) to help your high profile site actually be "High Profile"? it's in there! Focus on Search Engine Optimization (SEO), every page, every line of code designed to be indexed by Search Engines so you and your website can get found. Absolutely! We even invented a new system for SEO to really make sure you get found. We call it MPOP. And it works! To learn more about MPOP click here. We also offer SEO review and consultation with your new site once you have it poulated? it's in there! Image/photo and page sharing for marketing purposes? it's in there! Contact Forms for establishing secure and confidential contact? it's in there! MP3 msuic player and music upload, storage and management online? it's in there! Video integrated pages to show your video from YouTube in your website? it's in there! FaceBook integration to show part or all your approved Facebook public content? it's in there! MySpace integration to show your MySpace stuff? it's in there! Client section and special client privledges area? it's in there! Client Tracking services? it's in there! Hit Counter? it's in there! Our exclusive MPOP domain name technology for helping you get found on the search engines? it's in there! Even more stuff not mentioned here? it's in there! 99.9% server uptime? it's in there! Control your site FROM your site - anywhere in the world? it's in there! Search Engine Site Submission with new sites? it's in there! One free banner for advertising purposes? it's in there! FTP (File Transfer Protocol) for managing your files and other content outside the Websagogo Site Module. Kind of a "My Documents" on the web. In fact unlike other FTP systems, with Webs-a-gogo, you can browse and see pics, listen to music, watch video, etc without downloading to your computer first. So yea...it's in there! One Free Month's Advertising Banner on our site? it's in there! Unlimited Tech support by email, chat & phone year round? it's in there! When it comes to offering functionality and web service, our motto is "YES, WE CAN". We have created so many websites for so many companies and people that we have made just about everything any website could need to succeed. And if we haven't made it yet, WE CAN. And if you find that you need something special and custom, we might even make it for your...free. If we can find a way to provide it to everyone in a way they can use it, the answer is YES...It's In there! And another really good reason to choose Websagogo is: We're a bunch of good people doing good stuff for the success of our customer's ! So come create your success story here. Then tell us and our other customers about it. We can't wait! 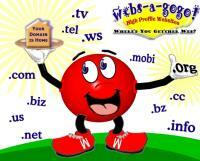 Domains Name from Webs-a-gogo...A Good Start. Want a High Profile Home on the Web...You're at the Right Place! This is where it all begins...with a Domain Name! To begin your Domain Name search click here, then type in your desired name choice in the blank provided. FREE! 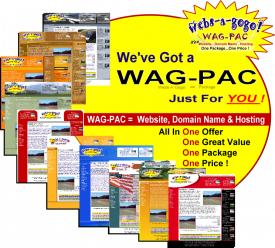 To get a Domain Name included FREE with your Hosting Package, or WAG-PAC here at Webs-a-gogo, click here! Once you find that special name that is "available", you will then be directed through the steps necessary to secure your domain name and a website/hosting package with it. Call it your own piece of the web! On the other hand, if you already have a Domain Name but still need a Website, we can help you there too. After all, websites are our specialty at Webs-a-gogo! Click here for information on how to Get a Website.